Worn separately or layered together, these coordinated necklaces from our Delicately Yours collection are perfect for highlighting your neckline with a silvery matte finish. Bold in their style, these necklaces come two to a pack featuring a rhinestone covered rectangle bar and a smooth chevron pendant. Including a 16 and 19-inch necklace, each jewelry piece is complete with chain extenders. 2 necklaces per package. Approximately 16" length. Lobster claw clasp with 1.5" extender. Red Acrylic, Fish Hook (earrings), Graduating Multi Row Necklace & Earring Set. Length 20" + extender. Earrings 1 3/8" with 2 3/4" drop. Worn separate or layered together, these coordinated necklaces from our Delicately Yours collection are perfect for highlighting your neckline with a golden matte finish. 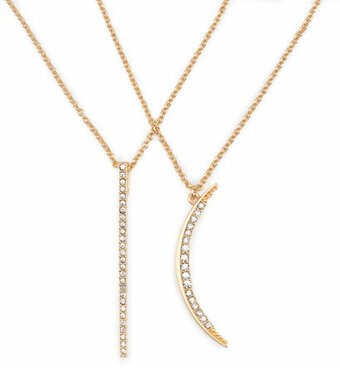 Minimal in their style, these necklaces come two to a pack featuring two rhinestone covered pendants including a thin crescent moon shape and a thin vertical bar. Including a 16 and 19-inch necklace, each jeweler piece is complete with chain extenders. 2 necklaces per package. Feminine in their style, these necklaces come two to a pack featuring a rhinestone covered bar and crystal clear quartz drops. Including a 16 and 19-inch necklace, each jewelry piece is complete with chain extenders. 2 necklaces per package. 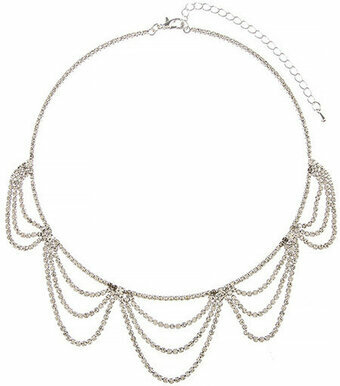 Rhodiumized Clear Cubic Zirconia Delicate Necklace. Length 16 1/2" + extender. Pendant 1/2" diameter. 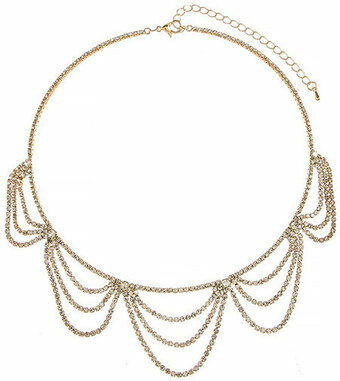 Rhodiumized Metal Link Multi Row Necklace. 17 3/4" + extender. 2 1/2" drop. Rhodiumized, Clear Rhinestone, Metal, Fish Hook (earrings), Tree Pendant Necklace & Earring Set. Length 16 1/2" + extender. Pendant 1/2". Earrings 1 1/4". 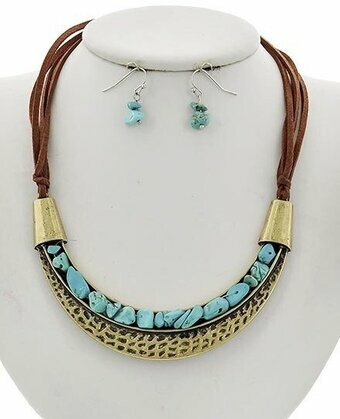 Burnished Gold Tone, Turquoise Stone, Brown Suede, Fish Hook (earrings), Necklace & Earring Set. Length 17 3/4" + extender. Earrings 1". Drop 3/4". Silver Tone Ab Glass & Clear Rhinestone, Post (earrings), Necklace & Earring Set. Length 13" + extender. Earrings 1 1/4" with 1" drop. Silver Tone, AB Mother of Pearl, Fish Hook (earrings), Graduating, Necklace & Earring Set. Length: 18 1/2" + extender. Earring: 1/2" x 1 1/2" with 2" drop. Silver Tone, Abalone Shell Fish Hook (earrings) Delicate Palm Tree Necklace & Earring Set. Length 17" extender. Pendant 3/4" X 1 1/4". Earrings 1 1/2". Silver Tone Black Glass & Clear Rhinestone, Post (earrings), Necklace & Earring Set. Length 13" + extender. Earrings 1 1/4" with 1" drop. Antique Silver Tone Black Suede Cord Fish Hook (earrings) Religious Cross Pendant Necklace & Earring Set. Length 16 7/8" + extender. Pendant 1 5/8" X 2 3/4". Earrings 5/8" X 1 7/8". Antique Silver Tone, Blue Glitter Epoxy, Fish Hook (earrings), Dragonfly Pendant Necklace & Earring Set. Length 16" + extender. Pendant 2" X 1 1/2". Earrings 1 1/4". Silver Tone, Blue Glitter, Fish Hook (earrings), Sea Life Sea Shell Necklace & Earring Set. Length 16" + extender. Earrings 1 1/8". Drop 1 1/4". Antique Silver Tone Metal, Black Stone Filigree Pendant Necklace & Fish Hook Earring Set. Length 16" + extender. Pendant 1 1/4" W X 1 3/4" L. Earrings 1 1/2" L.
Silver Tone, Multi Color Epoxy, Fish Hook (earrings), Palm Tree Pendant Necklace & Earring Set. Length 16" + extender. Pendant 1" X 1 1/2". Earrings 3/4" X 1 1/4. Silver Tone, Multi Color Abalone Shell With Epoxy Fish Hook (earrings) Pendant Butterfly Necklace & Earring Set. Length 16" + extender. Pendant 1 5/8" X 1 5/8". Earrings 1 3/8". Burnished Silver Tone, Turquoise & Multi Color Stone, Green Seed Beads, Fish Hook (earrings), Flower Pendant Necklace & Earring Set. Length 18" + extender. Pendant 1 1/4" X 1 1/2". Earrings 3/4" X 1". Silver Tone Orange Epoxy, Post (earrings), Dog or Cat Paw Print Delicate Necklace & Earring Set. Length 15 3/4" + extender. Pendant 1 5/8" X 1/4". Earrings 1/4". Burnished Silver Tone Turquoise Stone, Fish Hook (earrings), Crescent Pendant Long Necklace & Earring Set. Length 30" + extender. Pendant 2 3/4" X 2 1/2". Earrings 3/4". Burnished Silver Tone, Turquoise Stone, Fish Hook (earrings), Western Theme Arrowhead Delicate Necklace & Earring Set. Length 17 1/4" + extender. Pendant 5/8" X 1". Earrings 1". Length approximately 24". Pendant 1.5" x 2". Lobster claw clasp with 3" extender. Length approximately 19" with 3.4" extender. Lobster claw clasp. Length approximately 18.4" with 3.3" extender. Lobster claw clasp. Fish hook ear wire. Swarovski Crystal Encrusted Bar With Mom Pendant Necklace in Gift Box. Approximately 18" length. Lobster claw clasp with 3" extender. Teal Acrylic Seed Beads & Mother Of Pearl, Fish Hook (earrings), Long Necklace & Earring Set. Length 32" + extender. Earrings 1 1/8" X 1 7/8" with 1 1/2" drop. Approximately 15" length. Lobster claw clasp with 2" extender. Length approximately 20" with 3" extender. Lobster claw clasp. Fish hook ear wire. Length approximately 19" with 2" extender. Lobster claw clasp. Gold Tone Turquoise Semi-precious Stone Pendant Long Necklace. Length 29" + extender. 7/8" X 1 7/8". Velvet Necklace Cord - Black - 18 in. 1 piece per package. White Gold Tone, Grey Glass Crystal, Fish Hook (earrings), Tassel Pendant Long Necklace & Earring Set. Length 30" + extender. Pendant 3/4" X 3 3/8". Earrings 1". White Pearl Look Acrylic Seed Beads Multi Strand Necklace & Earring Set. Length 20 1/2" + extender. Earrings 2 1/4" with 1" drop. Black wire necklace. 17-1/2 inches. 2 pieces per package. Antique brass ball chain necklaces. 3mm x 18 inches. 3 pieces per package. Antique copper ball chain necklaces. 3mm x 18 inches. 3 pieces per package.